The Russian Revolution of 1917 transformed the face of the Russian empire, politically, economically, socially, and culturally, and also profoundly affected the course of world history for the rest of the twentieth century. Now, to mark the centenary of this epochal event, historian Steve Smith presents a panoramic account of the history of the Russian empire, from the last years of the nineteenth century to the end of the 1920s when Stalin unleashed violent collectivization of agriculture and crash industrialization upon Russian society. Drawing on recent archival scholarship, Russia in Revolution pays particular attention to the varying impact of the Revolution on different social groups including peasants, workers, non-Russian nationals, the army, women, young people, and the Church. The book provides a fresh approach toward the big, perennial questions about the Revolution and its consequences. Why did the tsarist government's attempt to implement political reform after the 1905 Revolution fail? Why did the First World War bring about the collapse of the tsarist system? Why did the attempt to create a democratic system after the February Revolution of 1917 never get off the ground? 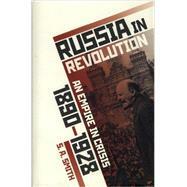 Why did the Bolsheviks succeeded in seizing power? Why did Stalin come out on top in the power struggle inside the Bolshevik party after Lenin's death in 1924? A final chapter reflects on the larger significance of 1917 for the history of the twentieth century and, for all its terrible flaws, what the promise of the Revolution might mean for us today. Steve Smith is a historian of modern Russia and China, who was a graduate student at both Moscow State University and at Peking University. He is the author of many books and articles on the Russian and Chinese revolutions, including Red Petrograd: Revolution in the Factories, 1917-18 (CUP, 1983) and Revolution and the People in Russia and China: A Comparative History (CUP, 2008), and is editor of The Oxford Handbook of the History of Communism (OUP, 2014). He taught for many years at the University of Essex, where he is an emeritus professor, and then at the European University Institute in Florence, before being elected to a senior research fellowship at All Souls College, Oxford, in 2012.